With legal aid budgets under extreme pressure and the cost of hiring a lawyer out of reach for many, self-represented litigants are increasingly common, particularly in the civil and family court systems. Christine Demiris takes a look at the litigants who go it alone. Last week, John* represented himself at a three-day hearing at the Federal Circuit Court in Brisbane after being quoted $20,000 by a lawyer. Despite reaching an out-of-court settlement he was happy with, John found the experience confusing and stressful. ‘Just being able to stand in front of a courtroom and have your say … became quite difficult to get through,’ he says. John received some assistance in preparing his case from the Queensland Public Interest Law Clearing House (QPILCH). They helped him draft documents and explained the legal steps in the process. John says the assistance also helped him in forming questions for witnesses. Despite the obvious value of such pre-trial assistance, QPILCH coordinator and Federal Court solicitor Elizabeth Pendlebury believes that the ability of a litigant to successfully argue his or her own case ‘really depends on the litigant, it depends on how sophisticated they are themselves, how readily they wrap their heads around the information that we are able to provide’. About 30 per cent of trials in the Family Court involve an unrepresented party, according to the 2013 annual report published by the court. There are success stories, such as one self-represented client who, following an 18-month process, ran a five-day trial, obtained the orders he had been seeking and was then able to successfully respond to a consequent appeal. The lack of understanding about court and pre-trial processes presents a unique challenge to the courts. Judge Phillip Misso manages the damages list in the County Court of Victoria. He describes some self-represented litigants setting up their cases in an ‘almost indescribable’ manner when compared to what a lawyer would do. The result, according to Justice Misso, is a situation in which sometimes ‘I think you do have a pretty good case, you just haven’t had the means by which you can pull it all together’. For this reason, Justice Misso says, self-represented litigants ‘in the majority of cases … don’t come off too well’. There are measures in place to assist self-represented litigants in the County Court of Victoria, such as a self-represented litigant coordinator and informative videos and booklets. Some judges also assist self-represented litigants by making orders that are a sort of ‘roadmap’, setting out the steps that the person is required to take and signposting to help manage people’s expectations about the process. There is, however, a limit to what the court can do because of the need preserve the integrity of the adversarial system. ‘We have to be very careful that we don’t go too far to actually be the advocate for the self-represented litigant,’ says Justice Misso. Managing expectations is particularly important, and particularly difficult, when faced with a querulous litigant. Although they make up only a small percentage of the broader group of self-represented litigants, querulous parties can have a significant impact on the court process. Tania Sourdin is a professor of law and dispute resolution at Monash University. She says querulous litigants in some cases ‘present information which is incorrect or inaccurate, or behave in a way which makes it very difficult to run a case in an appropriate manner, and really to accord some dignity in terms of the processes’. The bad behaviour Ms Sourdin describes includes examples of stalking, deliberately causing delay and presenting information which is incorrect or inaccurate. ‘The way in which the person talks to the person on the other side is so appalling that one really wonders how justice can be done under those circumstances,’ says Sourdin. 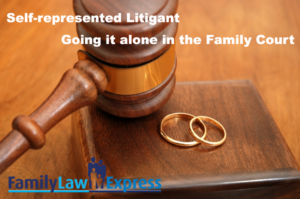 Communication between parties is a particular concern in the family law jurisdiction, where self-representation is common. Kate* acted for herself when her ex-partner sought to vary the care arrangements for their children. ‘The biggest problem was the fact that the other party did have a lawyer, and so I think he felt like he could push me around a little bit more than he may have if I had representation,’ she says. Like John, Kate consulted with a lawyer prior to her hearing, which she says helped her level of confidence. Nonetheless, Kate says that she would recommend hiring a lawyer for those who can afford it. ‘I would have felt much more confident … that would have maybe not made the situation so stressful,’ she says. The ability of an unrepresented litigant to effectively navigate the process and obtain a satisfactory outcome from the court when compared to a represented litigant depends on the case, according to Mark Le Poer Trench, a judge in Sydney’s Family Court. He believes that in less adversarial cases, such as parenting cases, the ‘judges take on a far more active role’ whereas in a more strictly adversarial case such as property disputes, it is up to the unrepresented litigant. ‘They have to put before the court evidence to support the orders that they are seeking,’ he says. Self-represented litigants also create a difficult situation in which alleged perpetrators of abuse or violence cross-examine their alleged victims. In those circumstances, ‘a judge just has to control it’ so as to ensure the alleged perpetrator is not further abusing somebody throughy their questioning, says Le Poer Trench. Eleanor* was directly cross-examined by her abusive ex-partner during Family Court proceedings. She describes the ‘horrendous’ experience as having ‘stripped’ her. ‘At the end of the day I walked out of there not sure whether I could actually face the court the next day, and I literally wanted to throw myself in front of the first bus,’ she says. Despite a warning from the magistrate that he only ask appropriate questions, Eleanor felt her ex-partner was given ‘all of his power back’. ‘Even though his questions may not have seemed to have been that bad to other people, he knew which questions to ask, he knew how to press the buttons of trauma for me,’ she says. The prospect of going to trial and being directly cross-examined by a violent ex-partner is a source of major discouragement against pursuing court action, according to Pasanna Mutha-Merennege, the Womens Legal Service of Victoria’s policy and campaigns manager. Ms Mutha-Merennege feels that, as well as additional legal-aid funding, there is a need for legislative protection to prevent self-represented litigants from being able to directly cross-examine vulnerable parties. About 30 per cent of trials in the Family Court involve an unrepresented party, according to the 2013 annual report published by the court. Given the considerable expense of hiring a lawyer and the strain on legal aid funding, that is unlikely to change. Instead, self-represented litigants are likely to become more common. Given this reality, guidance from the court and the sort of legislative protections advocated by Ms Mutha-Merennege will be increasingly important to ensure that people are able to navigate the justice system on their own.